Diagram of President Bush's plan to save the Earth. 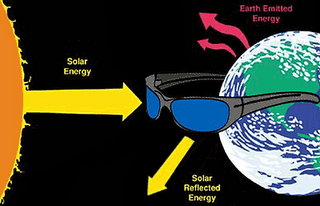 WASHINGTON - The US wants scientists of the world to block sunlight in a desperate gamble to halt global warming. An upcoming authoritative global scientific report will warn that human-caused global warming is here, and that it will only get worse in the future. Experts from across the world want to devise a worldwide emissions treaty, but the Bush Administration is attempting to steer clear of any efforts to reduce emissions. Instead, the US favors launching giant mirrors into space or pumping tons of reflective dust into the atmosphere. High quality global sun screens, crank 'n clutch operated shades, and rolling shutters have also been suggested, as well as a planetary patio. Each of these screens sports a Gold Mylar exterior with double-stitched borders, giving Mother Earth an exciting new look. Engineers will attach strategically placed gigantic suction cups to third world countries to ensure that the screens will stay in place and fit perfectly. It's been estimated that this technology could stop up to 90% of the sun's rays before they reach our planet's surface. These planet-screens could be "important insurance" against rising emissions that will save energy, protect highway strip malls, big box warehouses, and fried food franchises from fading away, and reduce glare -- all without blocking the view! The Bush team is expected to lobby for this strategy to the UN.